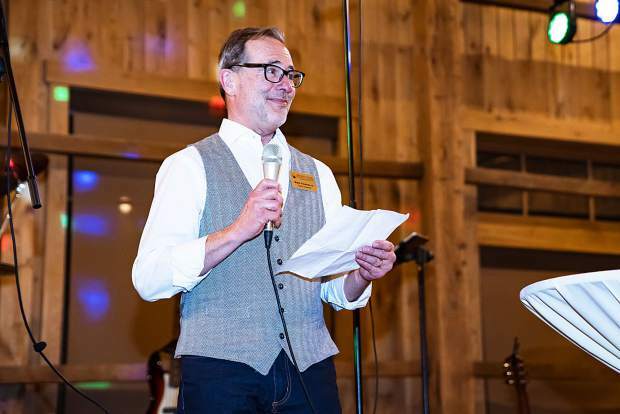 Dr. Mark Paulsen of Middle Park Health gives a speech March 2 during the Middle Park Health Foundation's annual BASH fundraising event. It was a gracious moment for Dr. Mark Paulsen when he was recognized earlier this month for his humanitarian service. Paulsen, a family practitioner at Middle Park Health-Granby Campus, was honored March 2 with an award recognizing his efforts, not only as a medical doctor but also as a steward of the community. Known as a humble man, Paulsen admitted he was a bit embarrassed when it was announced, during the hospital foundation’s annual BASH fundraising event, that he was the recipient of the COPIC Humanitarian Award, an award established in 2001 in honor of former COPIC board member, Harold E. Williamson. A loud “Surprise!” rang out from the audience, from Tiffany Freitag, director of communication relations and medical staff coordinator for Middle Park Health. Freitag and Bethanie Reynolds, director of nursing at Middle Park Health, nominated Paulsen for the award. A doctor in the state of Colorado for nearly 30 years, Paulsen has been the volunteer medical director for Grand Lake Fire for over a decade, as well as volunteer medical director for Granby Ranch Ski Patrol and YMCA of the Rockies-Snow Mountain Ranch Ski Patrol. He has donated his time to ensure first responders are well trained and that their protocols are clinically sound, according to the nomination form. “He is usually the first one in the office and the last one out,” read the nomination. He has also volunteered time lecturing to resident physicians about rural health care and advocating for their practice in rural communities. The COPIC Humanitarian Award provides a $10,000 grant to be given to the health-related nonprofit of Paulsen’s choice, which he promptly awarded to the Middle Park Health Foundation. When Paulsen stepped away from the microphone after accepting his award, he received a standing ovation from the audience. It was the event’s very first standing ovation, according to Jason Bryan, director of human resources for Middle Park Health. COPIC, the hospital’s medical liability and malpractice insurance provider, has honored over 25 physicians since the award was created. Paulsen now joins that select few, further distinguished as the first doctor from Middle Park Health to receive the award. Following his acceptance of the award, Paulsen and his wife, Heather, traveled to the Colorado State Capitol in Denver for further acknowledgment by state policy makers.